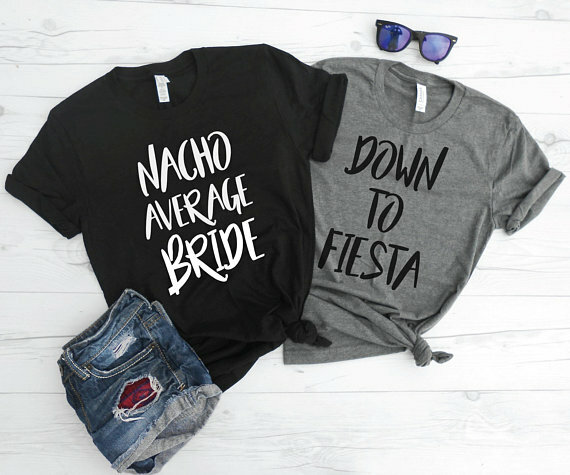 In search of a fabulous bachelorette party theme? We love the idea of a Mexican fiesta. 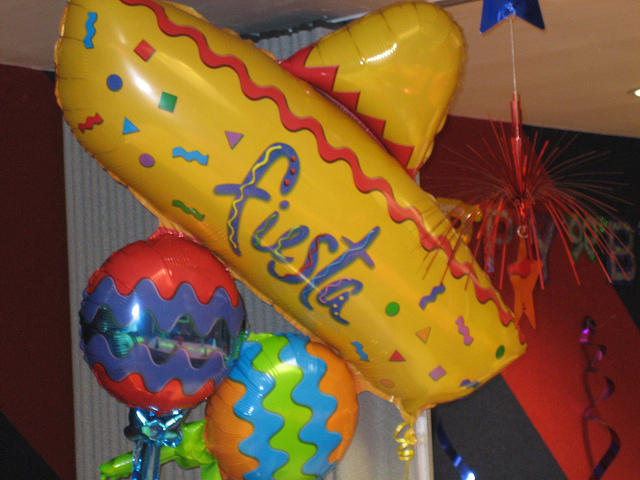 Fiesta is simply Spanish for party, so technically any party is a fiesta. However, the fiesta theme brings to mind images of Mexico. If you are having a destination party anywhere in Mexico, then the party should be one long fiesta. However, this is one destination party that is easy to duplicate at home, even if you barely have a budget for the bachelorette. 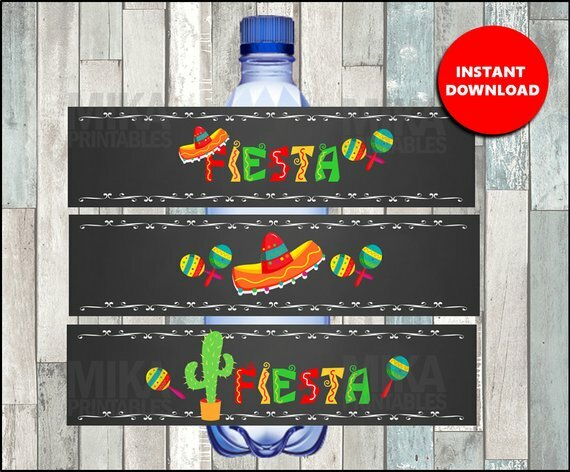 That is because the fiesta theme is easy to create and affordable. What does a traditional fiesta mean? Think brightly colored decorations, delicious Mexican food, and tasty drinks. 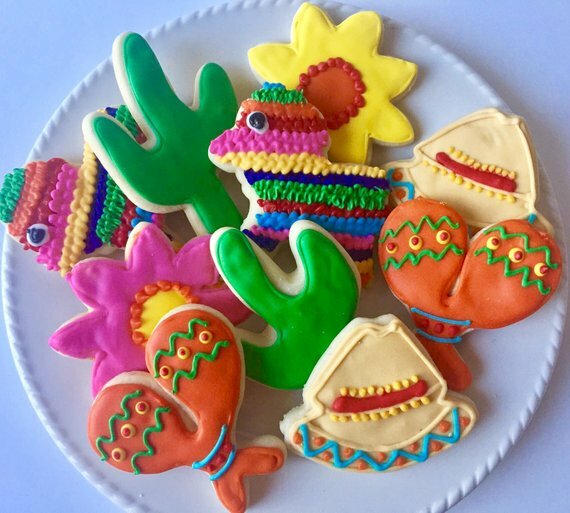 Fiesta decorations are easy to find, delicious Mexican food is widely available almost anywhere in the country, and tequila-based tropical drinks are easy-to-make. 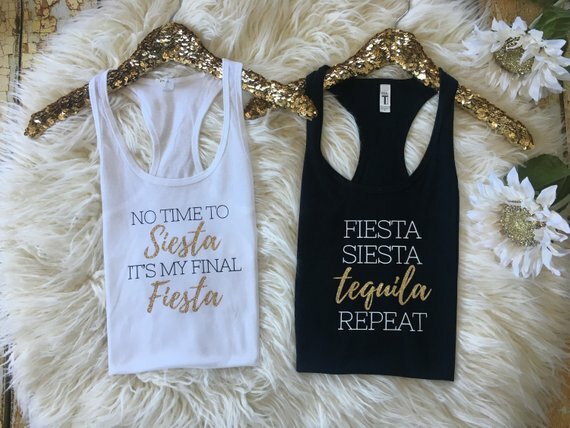 Put it all together and that means that even if parties are not your strong suit, you can throw together a Mexican fiesta bachelorette party that is Pinterest worthy. 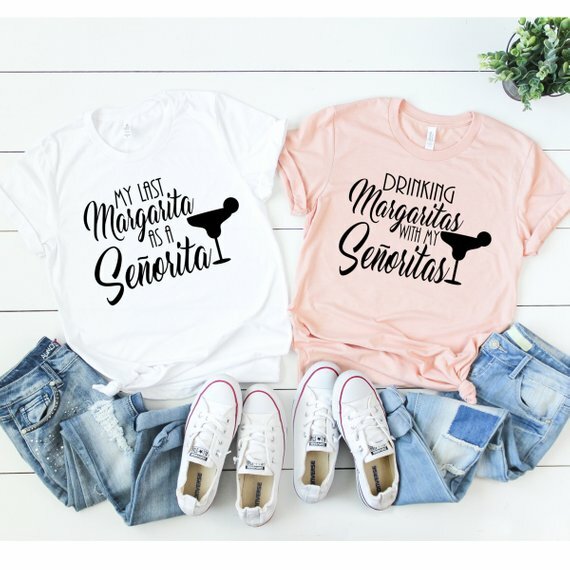 The first, and most important, decision when planning a destination bachelorette party is deciding whether you are actually heading to Mexico or whether you are going to throw your fiesta closer to home. You might think this decision is solely about finances, and there is no doubt that it is cheaper to have a party at home than to travel to Mexico. 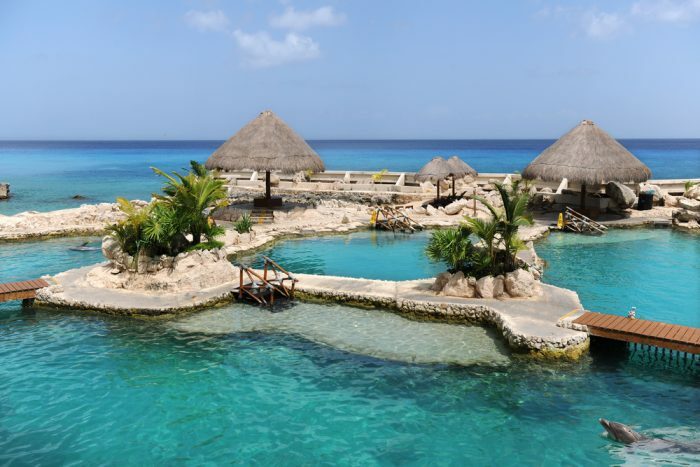 However, Mexico is known for its inexpensive resort locations, especially if you are traveling during the off-season. What do we mean by inexpensive? In the off-season, depending on your departure point and where in Mexico you are heading, you can pretty easily plan a full three-day weekend party for under $1000 per person and possibly pay about half of that if you are flexible and willing to hunt for a bargain. 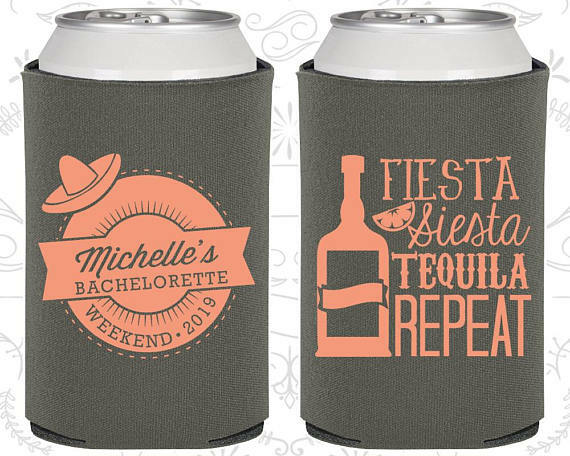 Throwing a local bachelorette party does not mean that you have to miss out on having an authentic feeling fiesta. You can create that feeling yourself, because a fiesta is just another name for a party. Do you have a great Mexican restaurant with a party room local to your area? 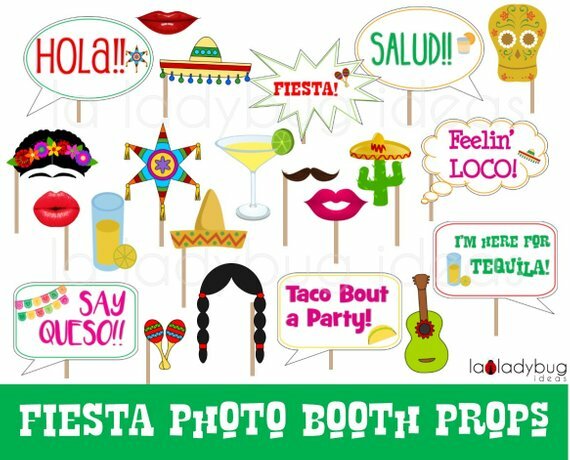 Capturing an authentic fiesta feeling can be as easy as booking that party room. 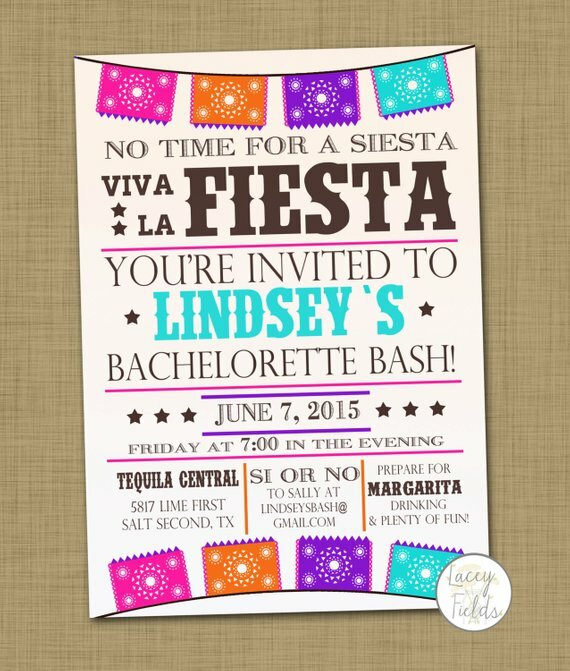 However, the fiesta theme is also an easy one to pull off at home, and is one of the better bachelorette on a budget ideas. Never heard of this magical resort city? That is no surprise, as it is less well known than some other popular resort cities. However, it is known for its magical beaches and amazing snorkeling and diving sites. You can also find some great shopping in the city. You’ll find plenty of all-inclusive resorts in the area, but it’s hard to beat the Club Med all-inclusive experience. History, beaches, beauty. 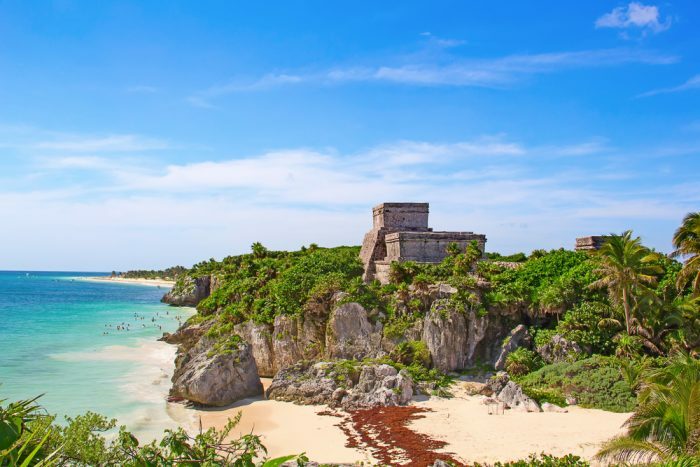 Tulum has a little bit of everything you could possibly want in Mexico. 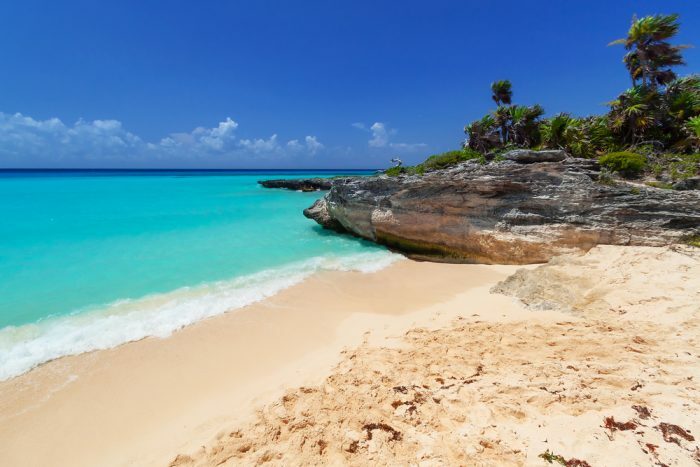 The Bahia Principe all-inclusive in Tulum is a bachelorette party favorite. Cozumel is one of Mexico’s favorite party cities, but it is also a can’t miss destination for wildlife lovers. Snorkel in one of country’s most beautiful beaches or swim with the green turtles. El Cozumeleno is not the city’s most famous all-inclusive resorts, but it is super affordable, making it one of the best value bachelorette destination sites in all of Mexico. 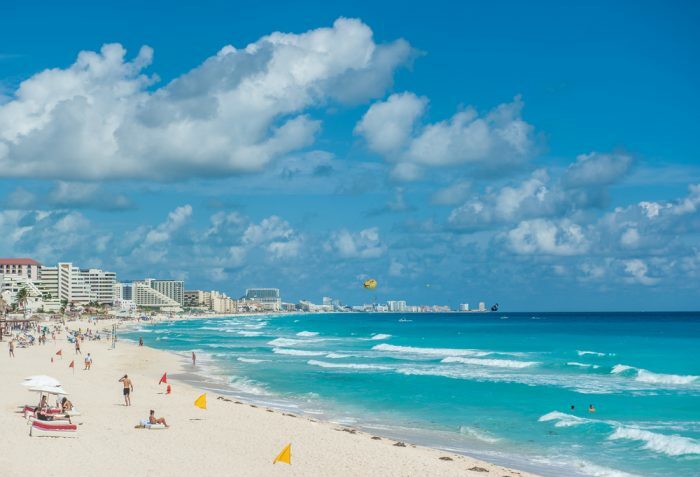 Playa del Carmen is known as a great party city. While it has a gorgeous beach scene, it is equally known for its foodie scene and its bar scene. The Royal Playa del Carmen is probably the most famous resort in the Mayan Riviera. While it is one of the pricier resort options, it is money very well spent. While you might generally think of the coast when you think of a Mexican destination bachelorette party, Mexico City is actually an awesome travel destination. 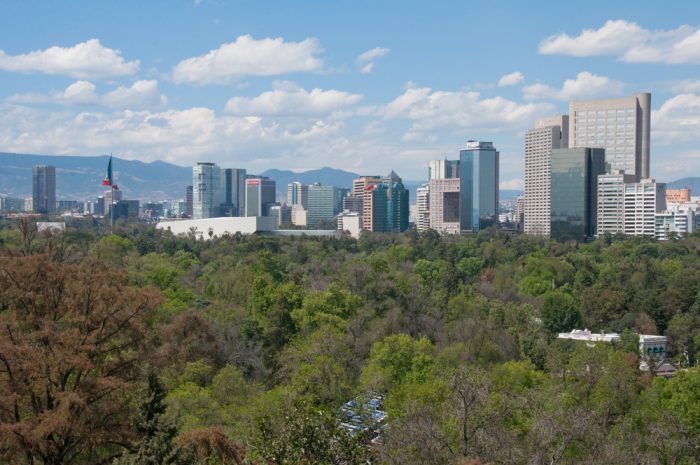 Shopping, history, fine-dining and culture all come together to make Mexico City an unforgettable destination. While the city can be surprisingly affordable, you can also choose to go luxe by staying at the Four Seasons. 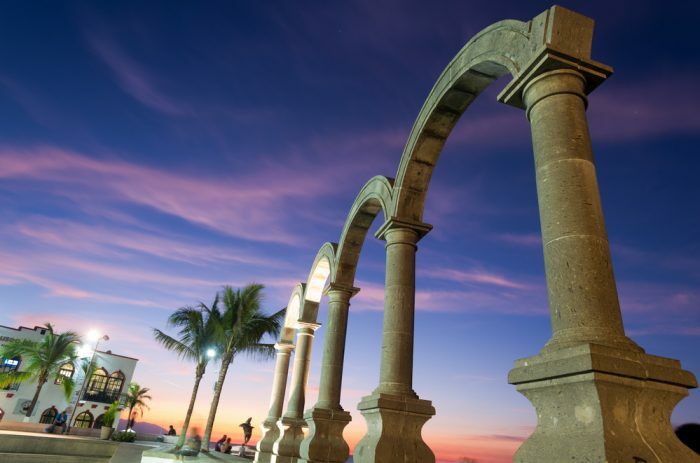 Puerto Vallarta is often described as quaint and it has managed to retain its quaint nature, despite being one of Mexico’s most popular vacation destinations. 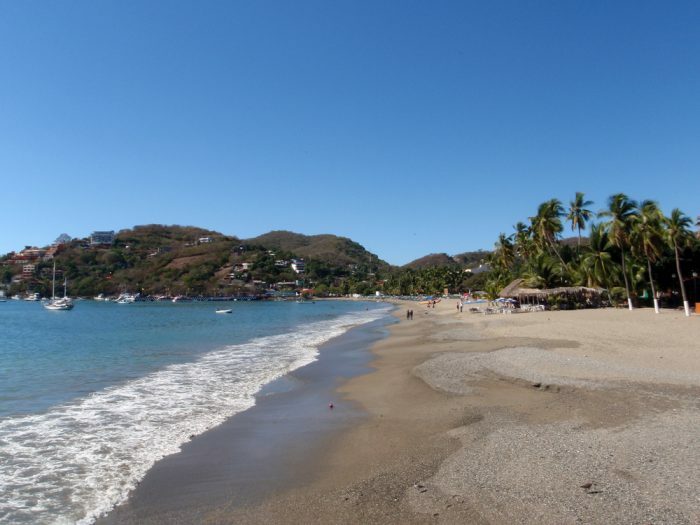 Think gorgeous beaches, iconic landmarks like Los Arcos, and great cuisine. Consider booking a room in the adults-only hacienda section of the Hilton Puerto Vallarta Resort. 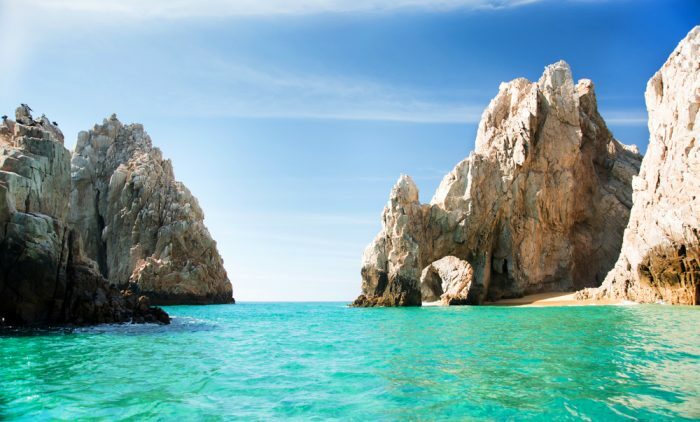 You have heard that Cabo is a favorite vacation destination for the rich and famous, but you might not realize that it is still a surprisingly affordable vacation place. It is a party place with all of the bars, spas, and resorts you could want, though, if you are looking for a quieter experience, you can also stay in nearby San Jose del Cabo. If you want to include golf in your plans, you may want to check out the Pueblo Bonito Pacifica Golf & Spa Resort. No party room to book? Turn your house into a hacienda. 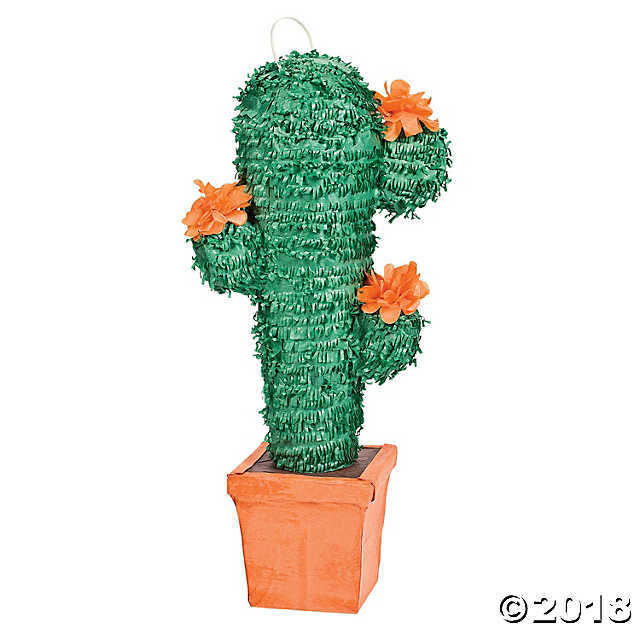 Don’t worry- decorating for a fiesta is easy. 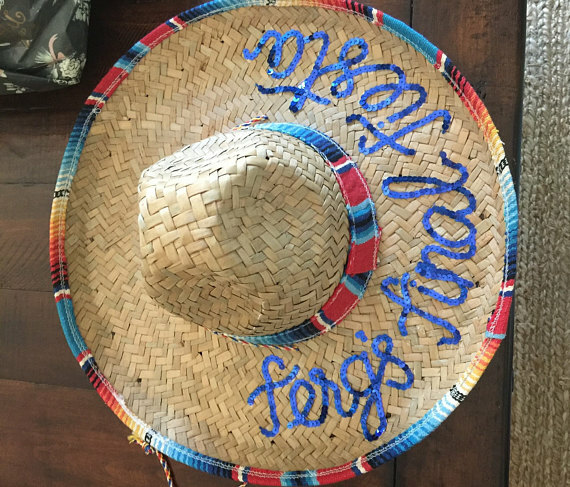 Simply think of iconic Mexican items, like sombreros, serapes, sugar skulls, bright flowers, cacti, and piñatas. 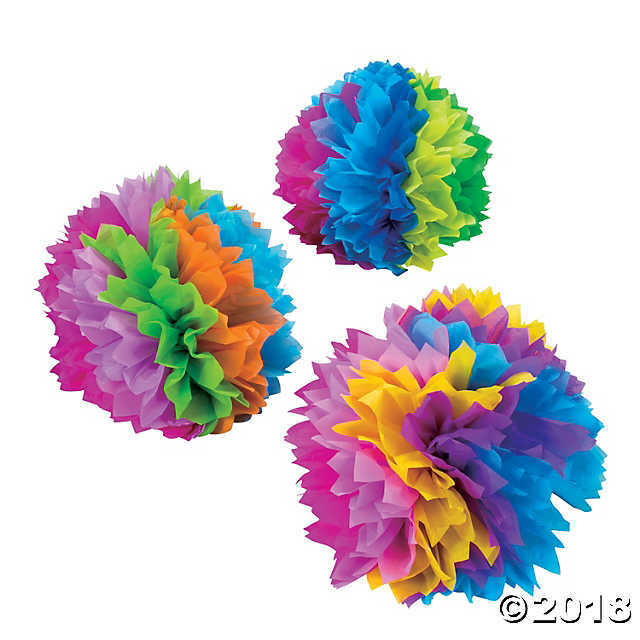 Tissue flowers are an iconic Mexican decoration. Used in isolation, they add a bright pop of color to the party. Used in large groupings, they can create a tremendous visual impact. We think they make a great frame for photo booths. These iconic Mexican hats add an instant party feel. 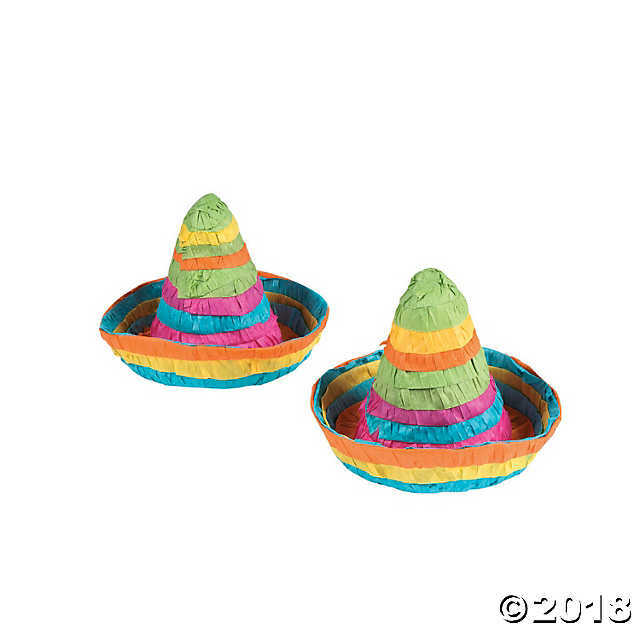 You can use them just as decoration, find sombrero shaped serving ware, or have plenty on hand for people to wear. 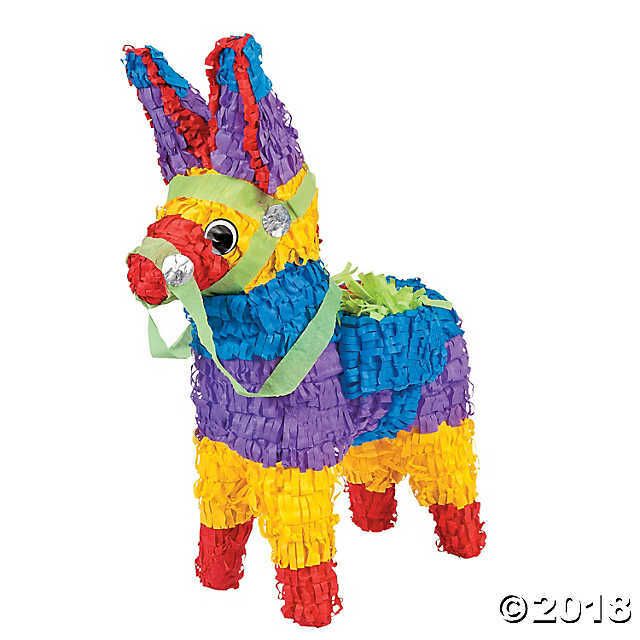 Donkeys, particularly donkey piñatas, are a traditional fiesta decoration. 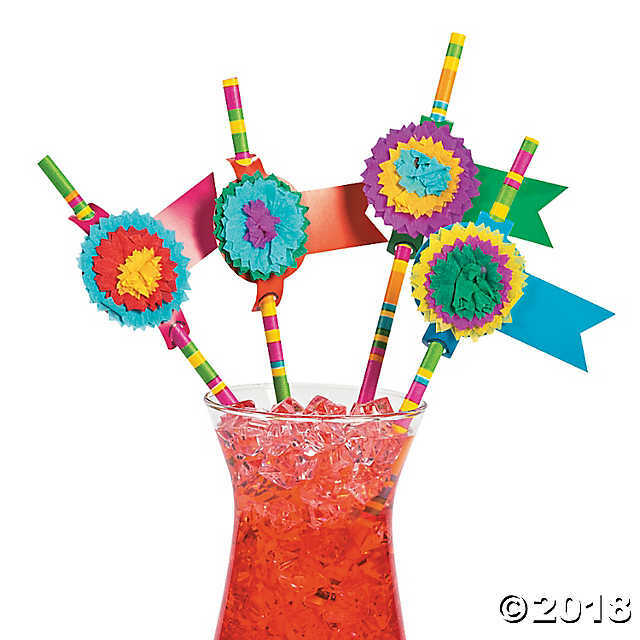 Brightly colored, you can scatter them around to add some fun to your party. We have mixed feelings about including sugar skulls on our list. 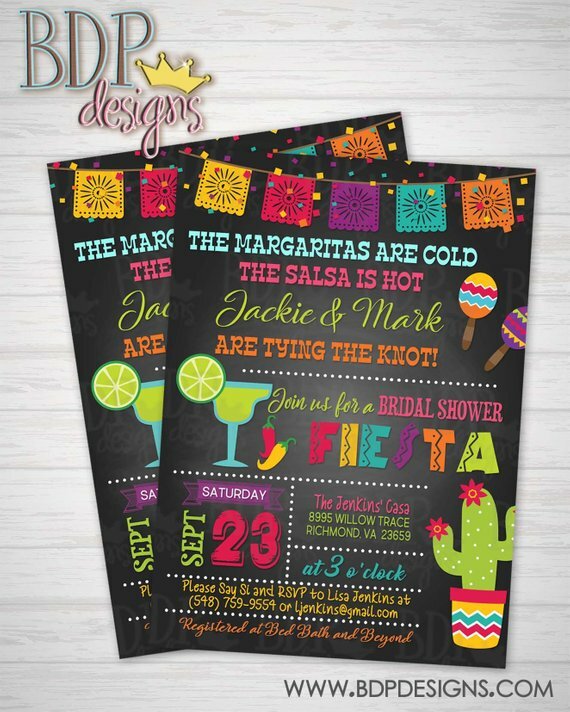 We love their bright colors and there is no doubt that they add an instant and iconic Mexican feel to any gathering. 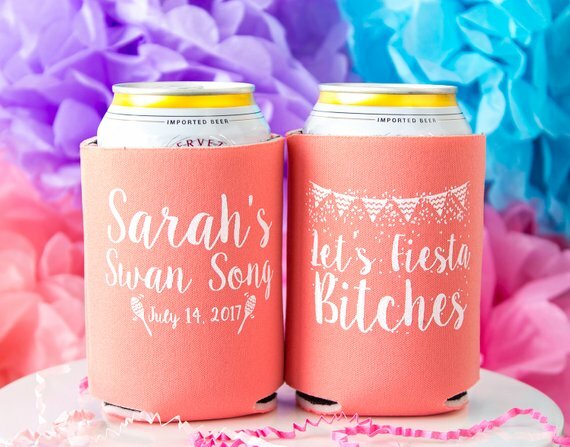 However, because of their religious and cultural connection, there are some legitimate questions about cultural appropriation that you might want to keep in mind if planning to include them in your bachelorette party décor. Of course, you could plan a destination party to Mexico City for its iconic Dia de los Muertos celebration if you want to see amazing sugar skulls. 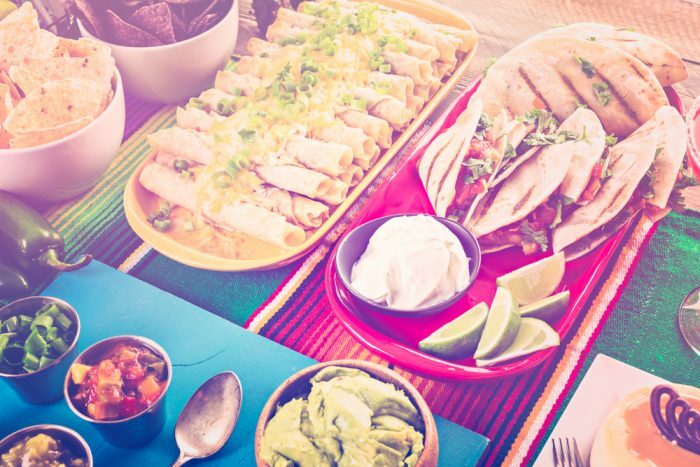 There are a ton of options for delicious Mexican themed menus for a bachelorette party. You can order catering or create the food yourself. If you are in charge of cooking, we suggest setting up a buffet to make it simple and easily customizable. 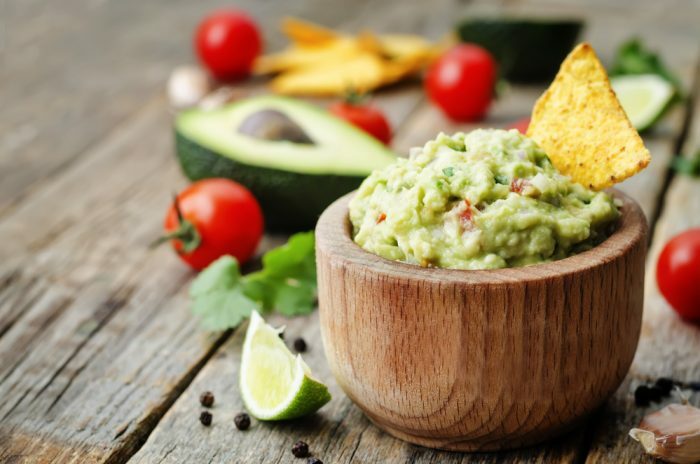 Nothing quite compares to freshly made guacamole, but, fortunately, it is easy for even novice chefs to put together. You need avocados, salt, lime juice, red onion, serrano or jalapeno peppers, cilantro, and some pepper. Queso is easy. It starts with a melted cheese base. You can get fancy, but processed cheeses like Velveeta actually melt perfectly for queso and greatly simplify your recipe. Add a couple of cans of Rotel tomatoes with green chilis and you have an easy dip. Want to get fancy? 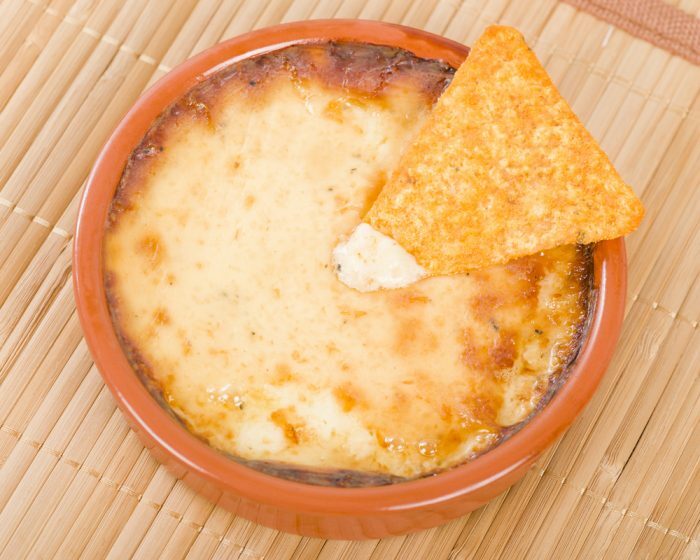 There are tons of great queso recipes out there. Our favorites use a traditional white Mexican cheese, queso blanco, instead of the more familiar bright orange-yellow American cheese. 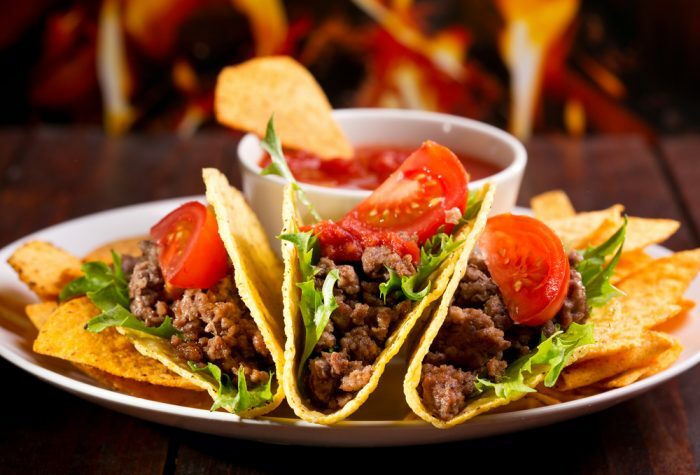 The basics for tacos are corn or flour tortillas, cooked meat, beans, cheese, pico de gallo, shredded cheese, lettuce, and sour cream. 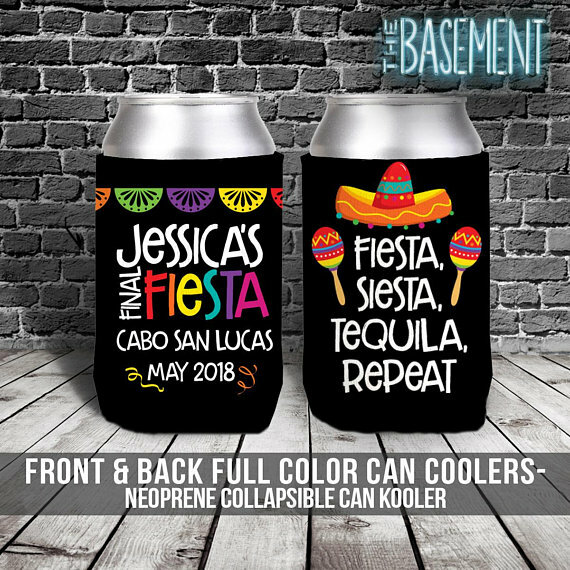 Planning a fiesta? You need tequila-based drinks and Mexican beer. 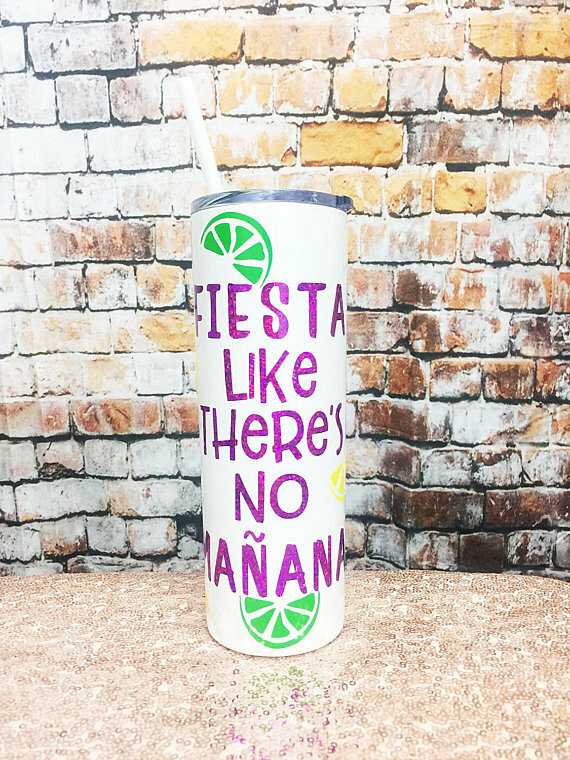 The go-to staple drink for fiestas, the basic margarita is a mix of tequila, orange liqueur, lime juice, and salt on the rim. You can serve them on the rocks or frozen. You can also modify them with almost any fruit flavor: strawberry and mango are popular. 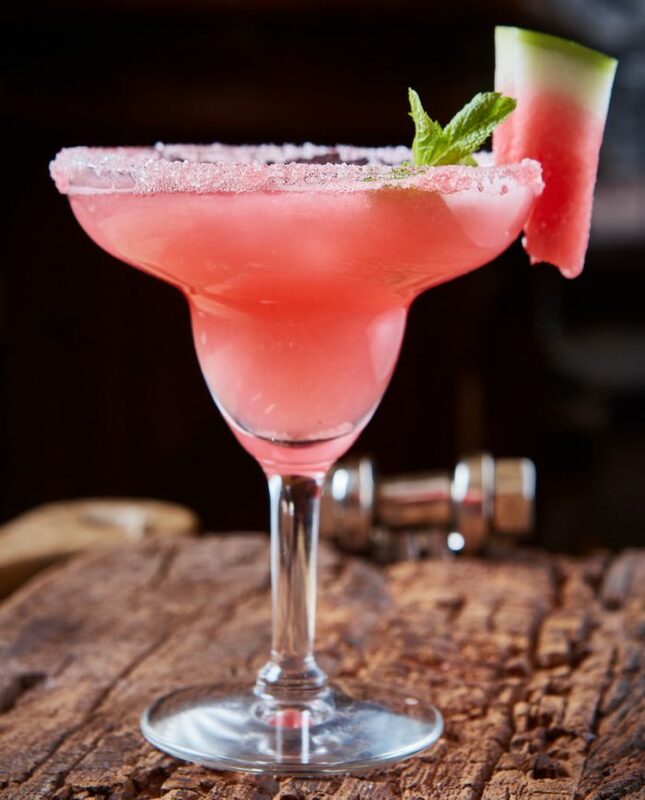 One of our favorite summer twists on the margarita is the watermelon margarita. 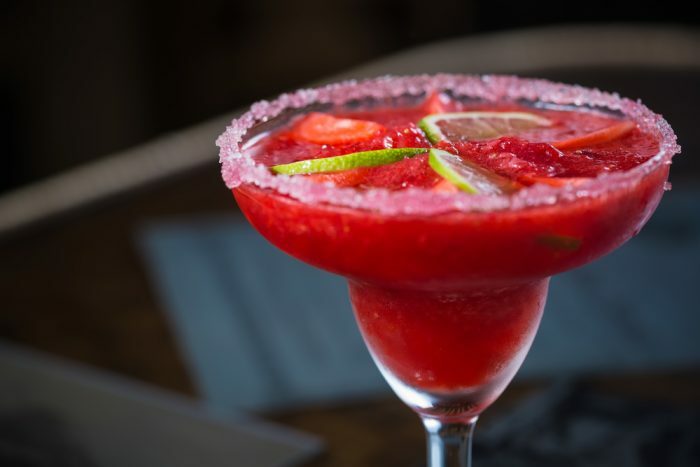 Easy to make, it is a blend of watermelon puree, simple syrup, lime juice and tequila. There are a few iconic Mexican beers: Corona, Tecate, Dos Equiis, Sol, and Modelo. 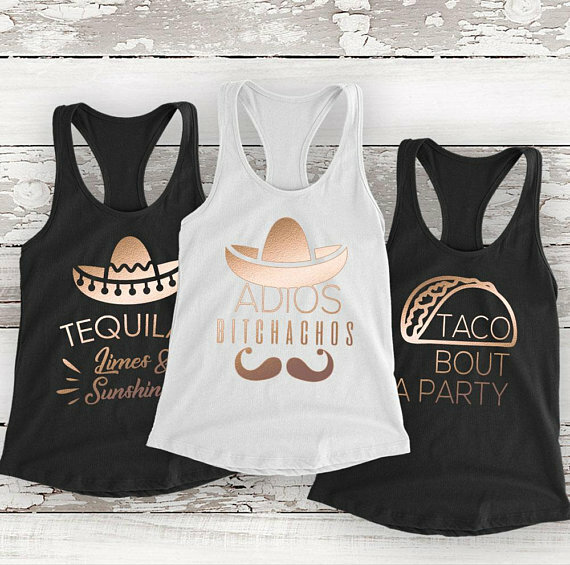 You don’t have to have all of them at your fiesta, but you can offer a selection of them. 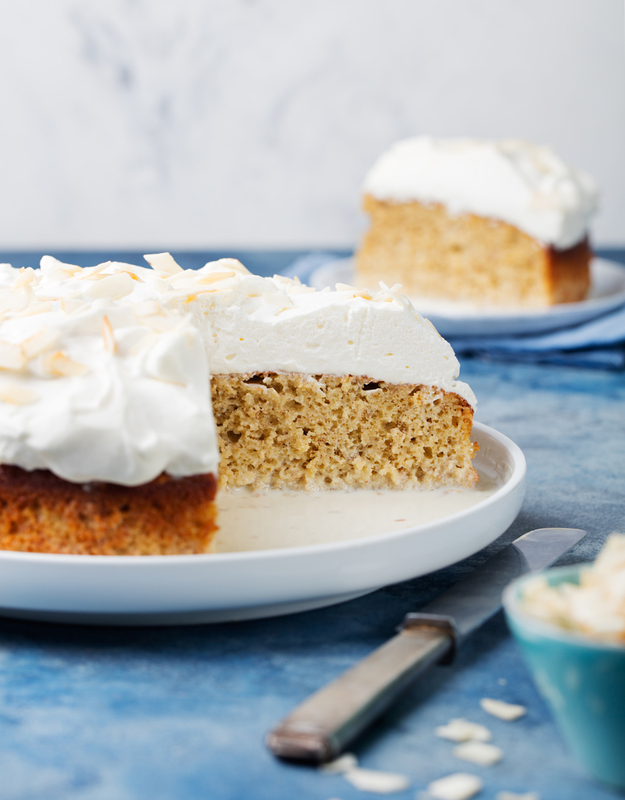 Many of them are traditionally served with a slice of lime. 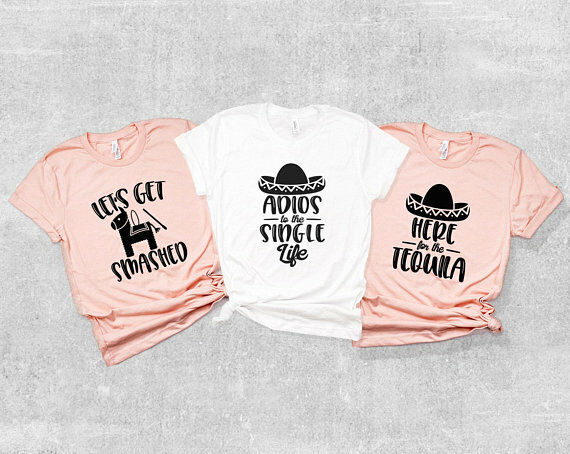 We love a bachelorette party t-shirt and there are some super cute themes and sayings for fiesta themed parties. 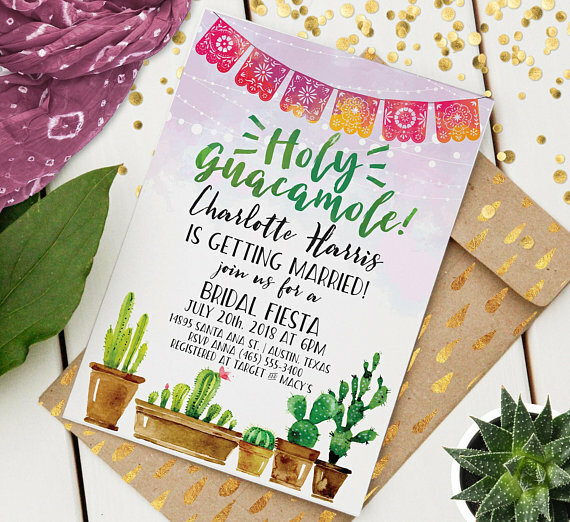 Fiesta-themed invitations are everywhere, so you can find one that matches your twist on the fiesta theme. 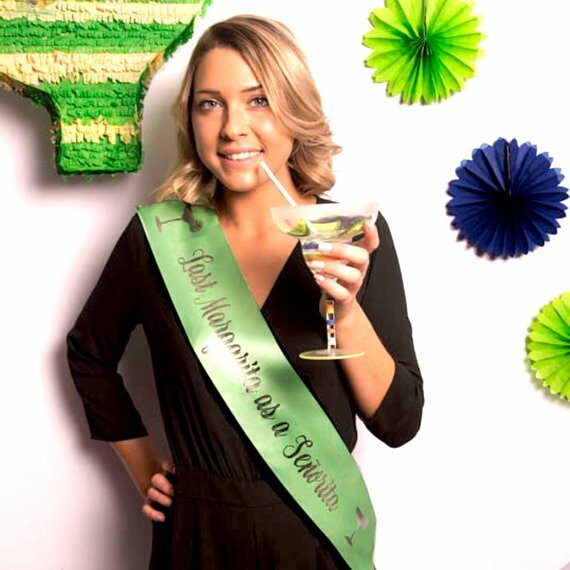 Sashes are a bachelorette party go-to. 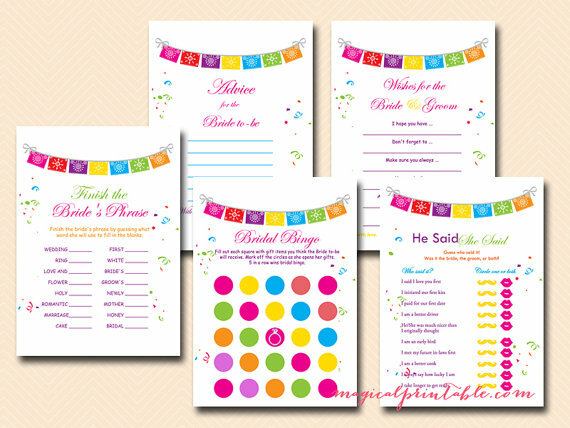 They are a fun way to distinguish the bride, help her stand out in a crowd, and provide a visual reminder that you are celebrating her. 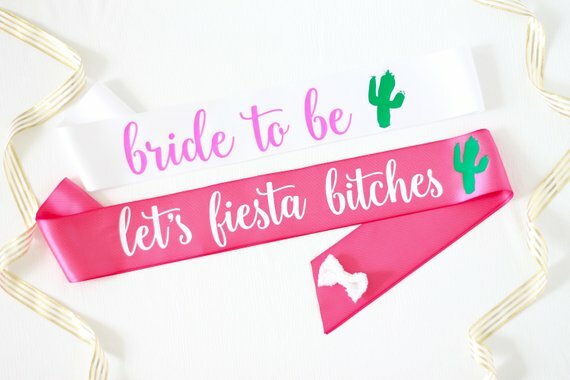 You could go with a plain bachelorette “bride” sash; there is nothing wrong with that. 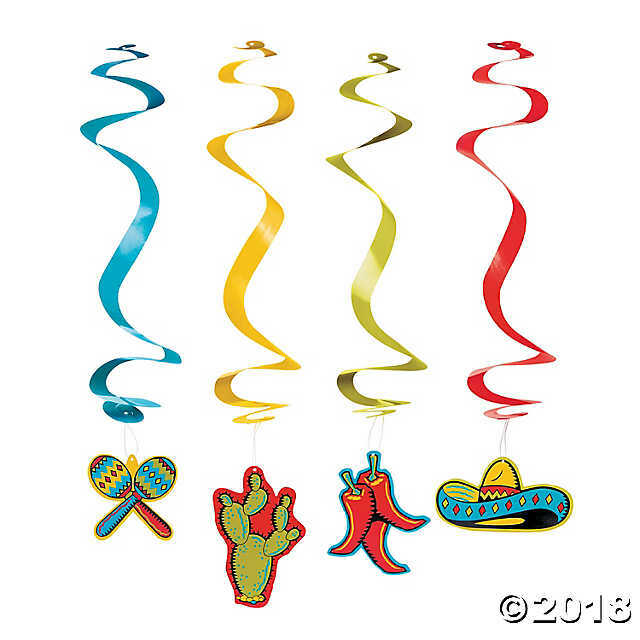 However, because the fiesta theme is so popular, it is very easy to find a fiesta-themed sash. 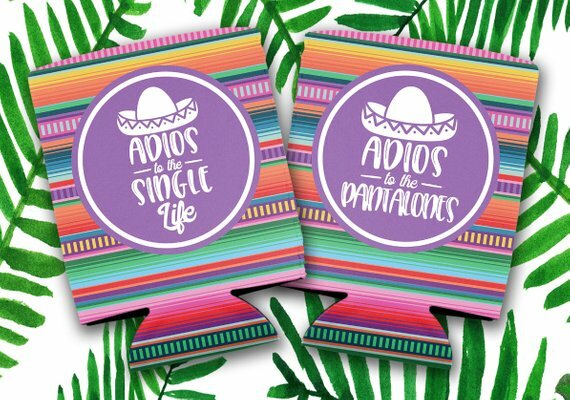 Keep your beer nice and cold and provide a cute, handy favor that your bachelorettes will use with personalized fiesta bachelorette party coozies. 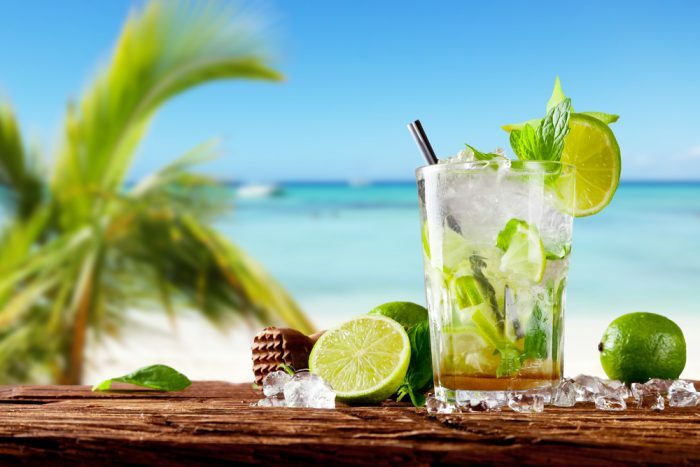 Hydration is really important, especially if you are enjoying a party on the beach or in another tropical location. 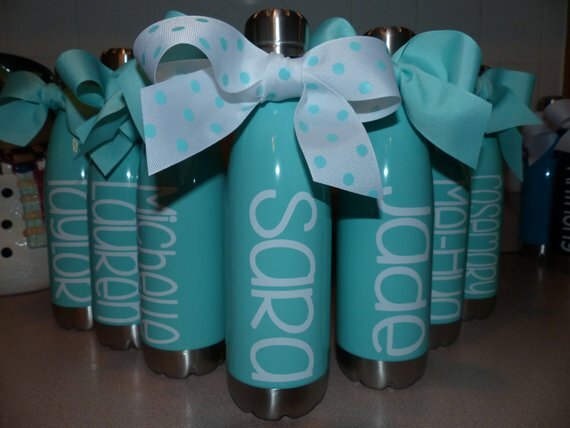 Water bottles are a great way to keep hydrated. 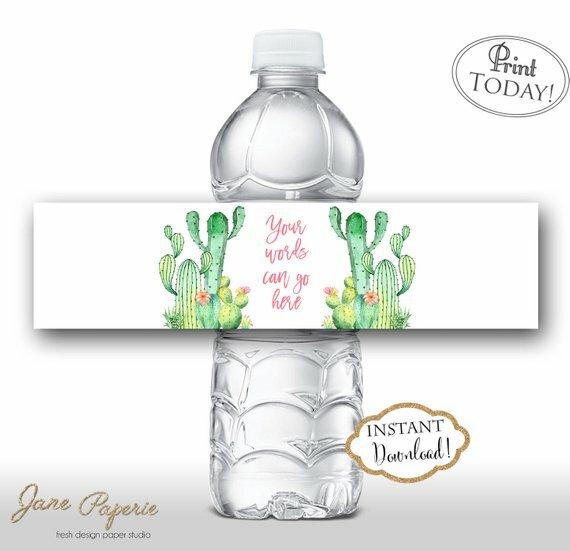 You can buy labels to personalize the bottles or you can go with a more environmentally friendly approach and buy reusable bottles. If you are having a fiesta, then you are going to need some games. 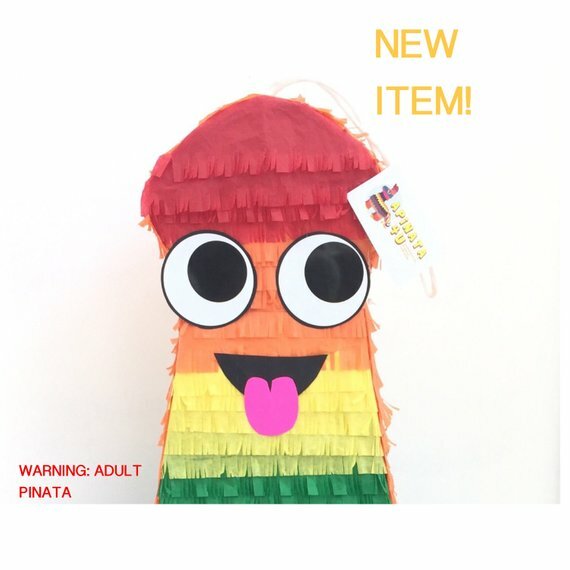 A piñata is pretty-much required for the fiesta theme, but the sky is the limit when it comes to other game possibilities. 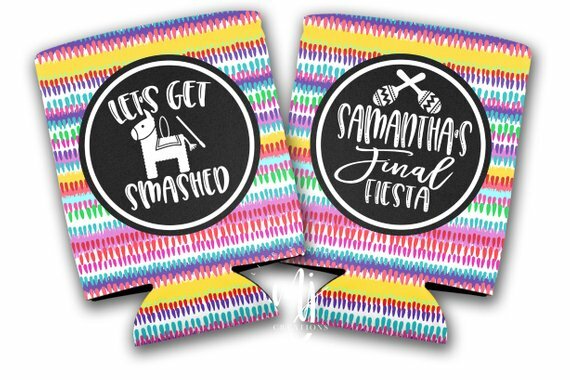 A fiesta is a great way to throw an excellent bachelorette party. If you have the budget for it, we highly recommend planning your fiesta as a destination party at a resort in one of Mexico’s well-known amazing party destinations. 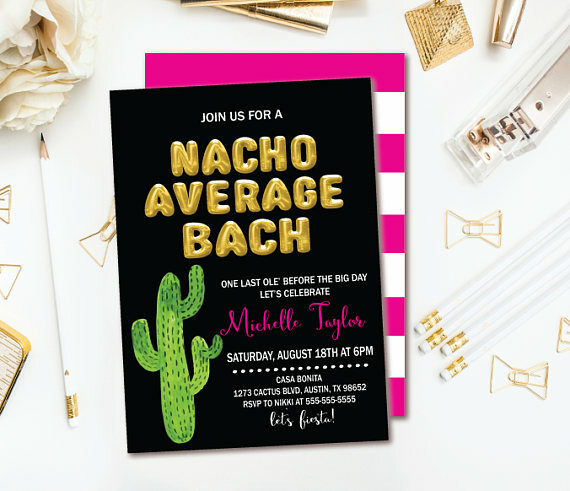 It really will be a once-in-a-lifetime experience, and a great way to celebrate a woman who is nacho average bride. 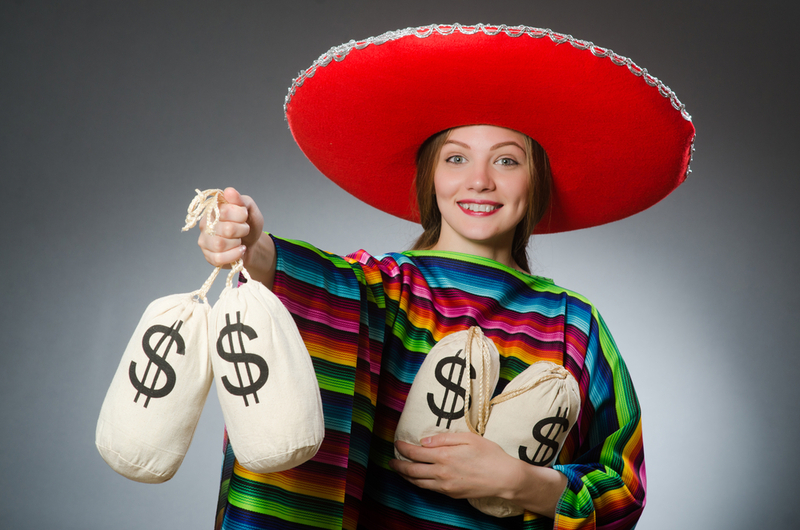 However, we know that pesos don’t grow on trees and that a destination party is not in every budget. Fortunately, throwing a bachelorette party at home is really simple. 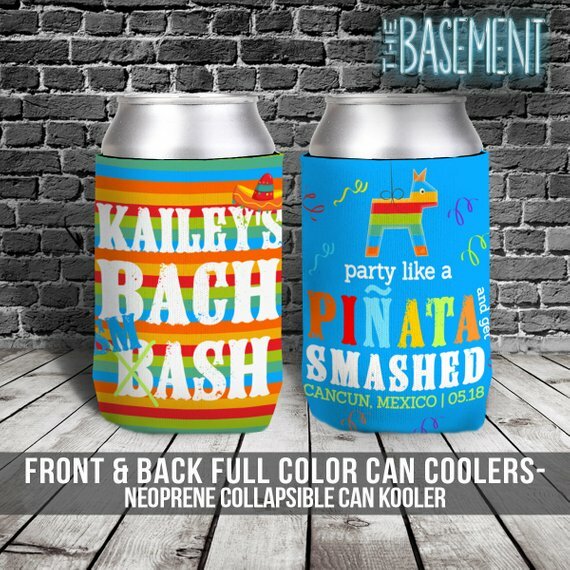 You can find inexpensive decorations that transform any place into a cozy and fabulous hacienda, you can get Mexican food catered or even make your own, and pitchers of themed Mexican drinks and a cooler of Mexican beer can bring the flavor of Mexico to your party.